On May 22, 2012, New York City restaurant Serendipity 3 set the Guinness World Records title for the world’s most expensive hamburger. Le Burger Extravagant, the name of the record-breaking burger, is priced at $295 and can be purchased at the restaurant with a 48-hour notice. Profits from the burger will be donated to The Bowery Mission, a nonprofit organization that feeds and assists the New York City’s homeless population. …a mix of Japanese Wagyu beef infused with 10-herb white truffle butter, seasoned with Salish Alderwood smoked Pacific sea salt, topped with cheddar cheese — hand-formed by the famous cheesemaker James Montgomery in Somerset, England, and cave-aged for 18 months — shaved black truffles, a fried quail egg and served on a white truffle-buttered Campagna Roll, which is topped with a blini, creme fraiche, and Paramout Caviar’s exclusive Kaluga caviar — a beautiful golden caviar with a buttery, nutty taste and large pearls from the Huso Dauricus farm raised in Quzhou, China. 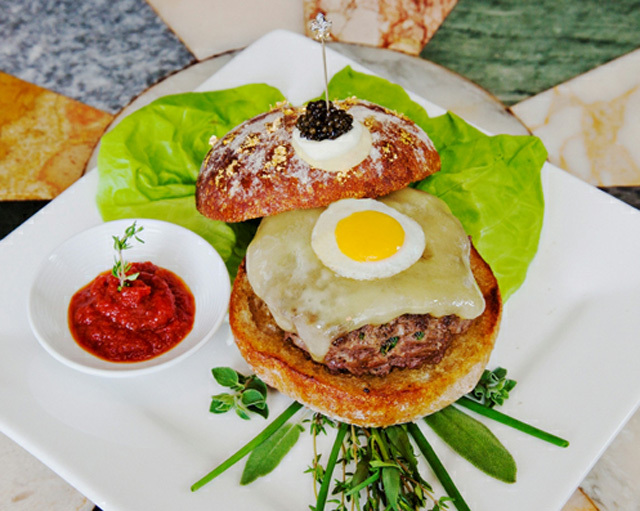 The finishing touch to this incredible burger is a solid gold “Fleur de Lis” toothpick encrusted with diamonds and designed by world-renowned jeweler Euphoria New York.